One of our most spectacular and breathtakingly beautiful species of indigenous bulbs, naturally thriving in warm and shady coastal areas. The Blood Lily is a truly marvellous addition to any garden, with a robust, thickly fleshy stem flecked with deep lavender coloured spots, long, fresh green leaves and enormous, arresting, vivid carmine or deep orange powder-puff flowers, each with hundreds of tiny, luminescent, yellow-tipped bristles, followed by an abundance charming, bright scarlet berries. 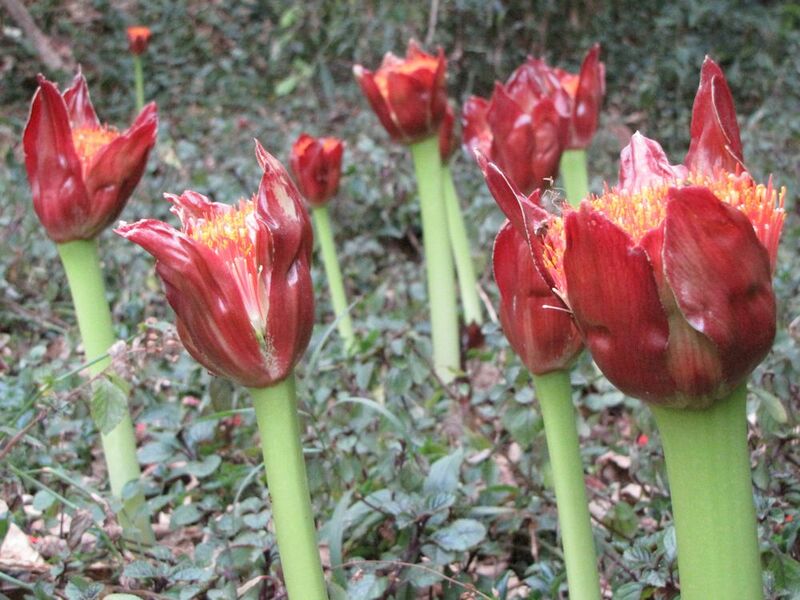 There are nine species occurring in South Africa, and these tulip-like plants have been cultivated in Holland since the early 18th century. 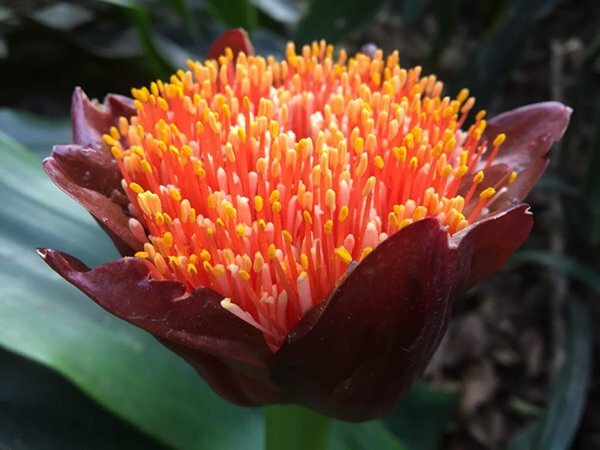 Native to, and most commonly found in, the coastal and eastern parts of South Africa, from the coast to altitudes of about 2000 m.
Scadoxus can be found in nearly all the Cape provinces, and a few of the more northern zones (Free state, Northern Cape, Gauteng), as well as Mpumalanga, Limpopo, Natal, Zimbabwe, and further north into tropical Africa. They typically grow in moist, cool, shady areas such as gorges and forest floors, where they can be found in amongst the moist leaf litter. 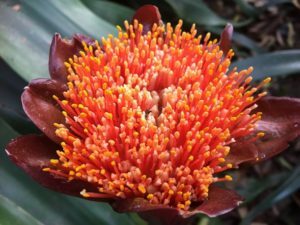 They do occasionally occur in drier localities such as scrubland, bushveld and open grasslands, and also grow in coastal thickets and on rocky outcrops. 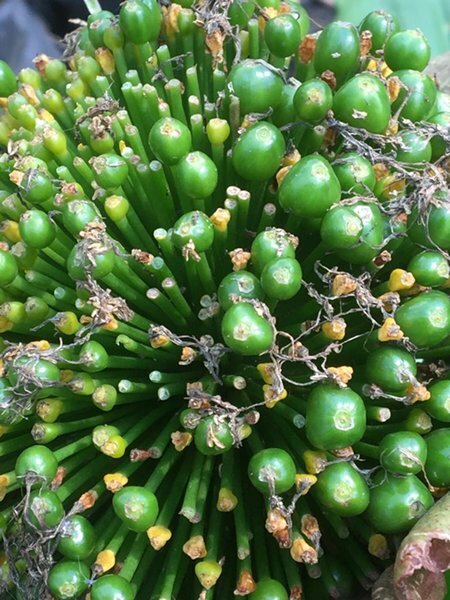 Lustrous, thickly textured, bright green, broad, strap-shaped and wavy margined leaves (200-300 x 100-120 mm), densely arranged around a false stem (400-800 mm). The leafstalk is dotted with numerous purple-reed spots. 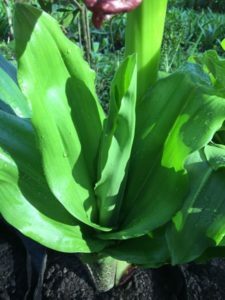 Towards the base of the stem, the leaves overlap in a sheath or rosette like formation. 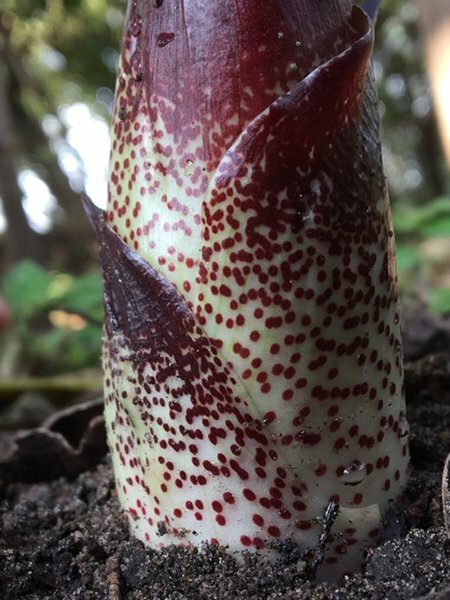 These basal, scale-like leaves have a distinct speckled appearance (numerous purplish or russet-brown spots), are carried separately from the stem, and emanate from the large underground bulb. 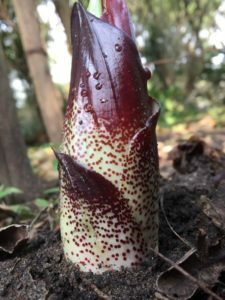 The bulb measures 80-100 mm in diameter, and has a short, thick stem at the base from which numerous, fleshy roots emerge. The leaves are produced before or after the flowers, and often turn yellow before being shed in late summer. 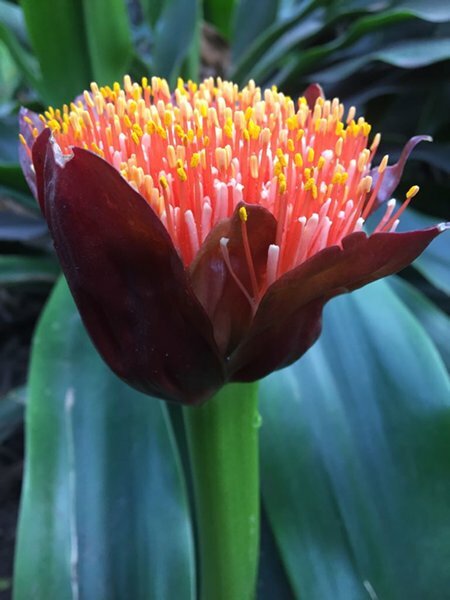 During winter, it goes into dormancy, and afterwards it can be seen shooting up many new flowers that appear to spring up out of the bare ground. 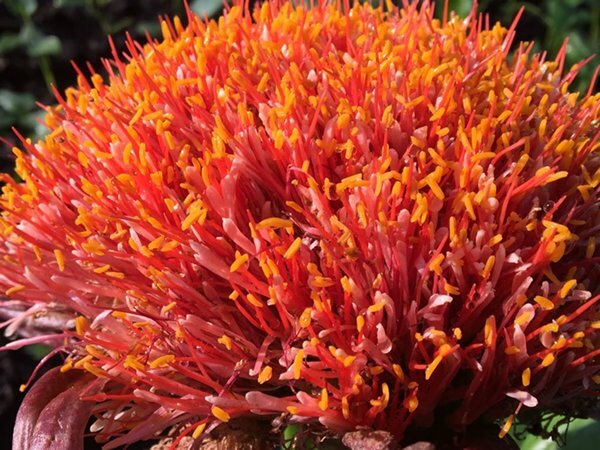 Compact, dense, scarlet to bright orange flowerheads (100-150 mm diameter), each consisting of many smaller individual, tube-like flowers with conspicuous, bright yellow anthers. The attractive flowers are borne on a stout, long stalk. 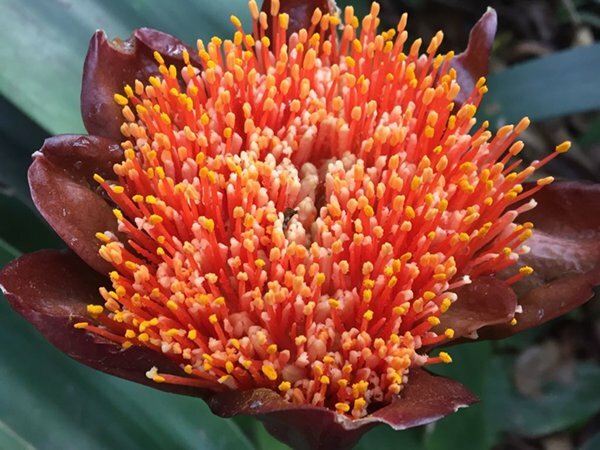 Each inflorescence is enveloped by and held within rather large, glossy, purplish to reddish-brown bracts (80-100 x 30-50 mm), that are held erect from the flowers upon emergence. When spring arrives, many young flower-buds, sheathed by the protective bracts, burst forth eagerly from the open ground. The flowers give way to small, fleshy green, spherical seeds (7-10 mm diameter), that ripen to a rich, glossy red. Each berry contains a single, soft, pearly seed. The seeds sometimes fall very close to the parent plant and will often germinate within a very close proximity of it. A naturally robust plant, reaching 500-1000 mm. Formerly included in the Haemanthus genus, to which it is very closely related, and under which many of its reported uses are still classified, Scadoxus is used medicinally in many parts of Africa, despite containing toxic substances. 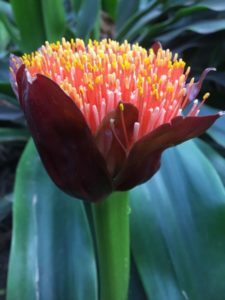 It is rich in isoquinoline alkaloids (Amaryllidaceae alkaloids), which have shown strong convulsive actions, and are highly toxic. 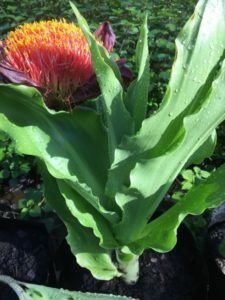 The bulb and roots are nonetheless used in traditional medicines to treat gastrointestinal disorders, headaches and coughs. The leaves are also crushed and applied to wounds, sores and ulcers as they are said to assist healing due to their antiseptic properties. Concoctions are taken as diuretics, and as an antidote to poisoning. In certain cultures, preparations of the plant form part of a remedy taken at regular intervals during pregnancy to ensure a safe delivery. 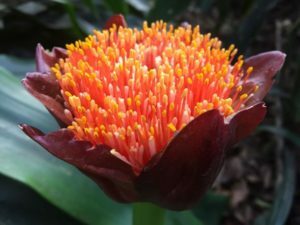 It must be stated that plants containing the aforementioned alkaloids have somewhat limited medicinal value and benefits and should not be used indiscriminately as large doses could prove fatal. The striking flowers will last a long time in a cut flower arrangement or a vase, with or without added water. 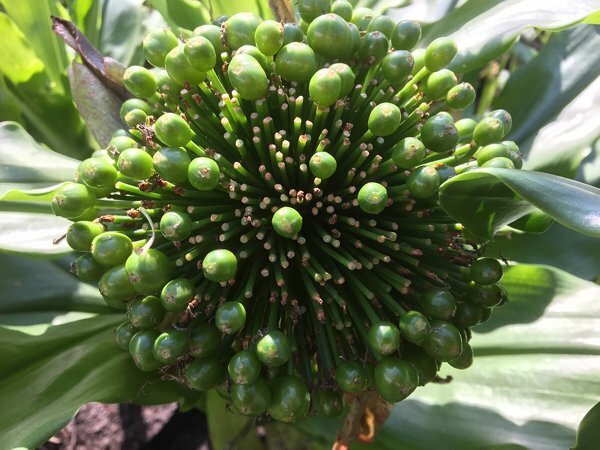 If synthetic pollination is done on the flowerhead, it will oftentimes develop the beautiful red berries, even if it has been partly removed from the main stem. 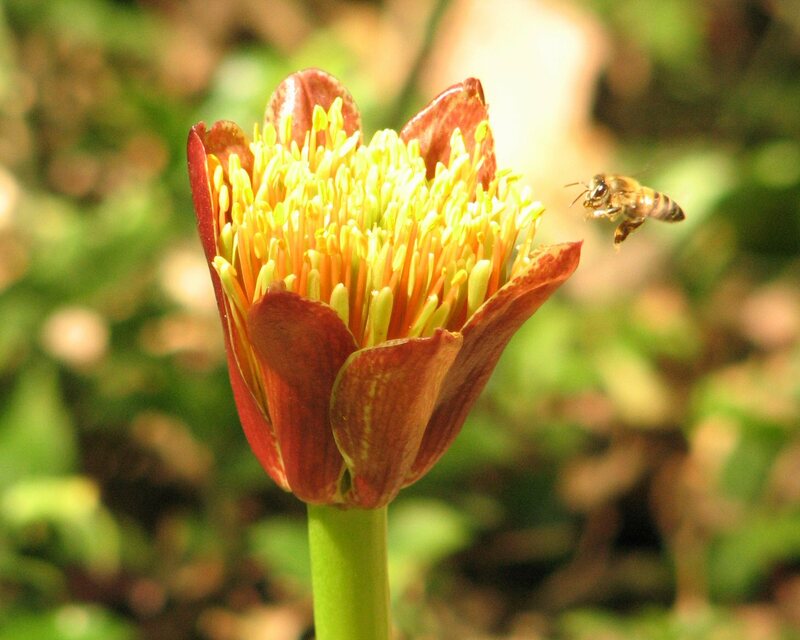 The bulb is known to be poisonous, and the pollen is reputed to be mildly so. 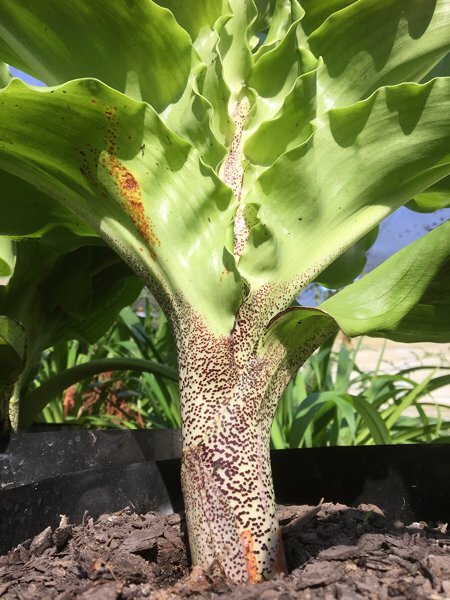 The parasitic Amaryllis Lily borer moth (Brithys crini), whose larvae attack and destroy the fleshy stems and leaves of the plants, are known to be a problem in cultivated specimens. They seem to attack plans that are planted too closely together or are in mostly shady conditions. 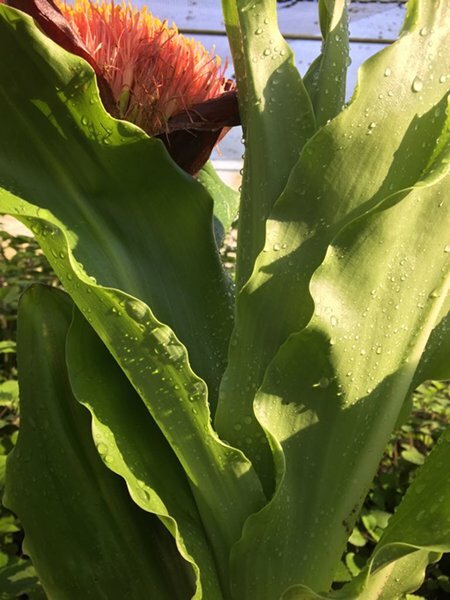 In a sunny, open position, the plants seem to develop a certain toxin in their leaves which acts as a deterrent for these pests and is said to kill the young offspring. Check your plants regularly for signs of infection, before it is too late. Scadoxus attracts a variety of wildlife to the garden, as well as bees, butterflies and other insects. Nectar-eating birds such as sun- and sugarbirds flock to the nectar rich flowers, as well as the occasional weaver. The brightly coloured berries, when ripe, entice many seed-eating bird species, and are also much favoured by monkeys. The insects lured by the flowers will attract insectivorous birds and may also provide food for other smaller creatures. A wonderful choice for planting in the shade of large trees as it tolerates deep shade. 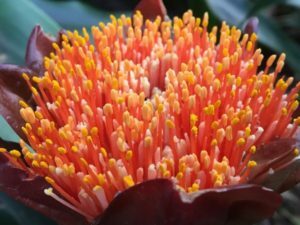 It is an excellent container plant, both for indoors and outdoors, and requires very little maintenance or special attention. Planted in groups, it makes for a stunning indigenous floral display, and the striking flowers will last for many weeks. It has something to offer the gardener in almost every stage of its life, from the ornate, deep red and orange flowers, to the purple speckled stems, lustrous and sleek green foliage and clusters of bright red, picturesque berries. 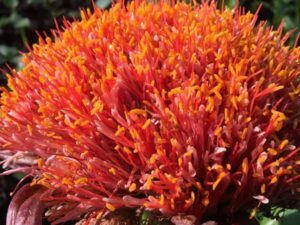 It will attract a host of wildlife to the garden, and creates a truly eye-catching display, especially if planted in groups. Makes a lovely addition to rockeries and is also a most beautiful focal or accent specimen. 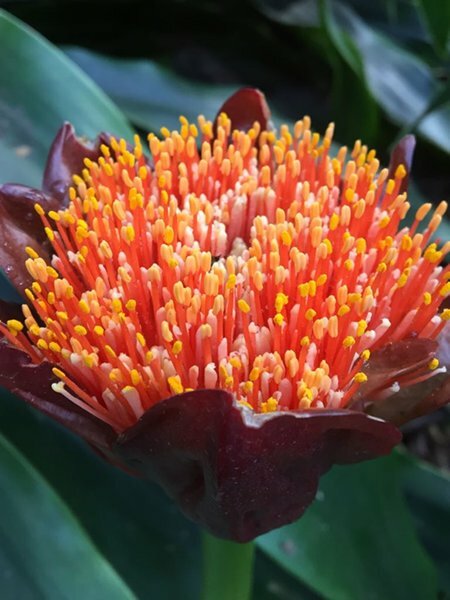 As it has the ability to store moisture in its underground bulb, the Blood Lily is able to tolerate dry conditions fairly well, especially during its dormant winter months. It can survive extended periods of little to no water and will also waistbands fairly high temperatures. It can endure moderate frosts but may be damaged by excessively cold conditions. 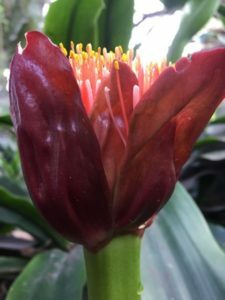 Plant in a sheltered position in very cold gardens. 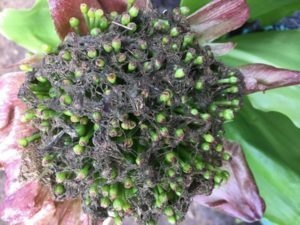 It should be left undisturbed, as unnecessary tampering will negatively affect flowering. It is a rather slow-grower by nature, but the specific growth rate may vary according to the environment it is planted in and the general care it receives. It will accept either full sun or semi-shade. It is however a naturally shade-loving perennial and does best when planted in the wake of other similar plants or in a rockery. Does well in the shade of larger trees and shrubs. 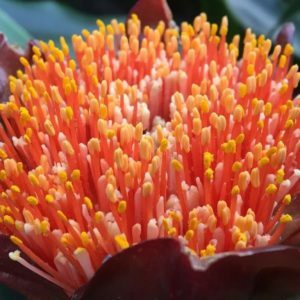 It will benefit from a sunny position, as the foliage, especially the colourful bracts, turn a deeper, richer colour, and parasites are less eager to attack the stems and leaves. Grows best in a loose, nutrient rich, moist but well-aerated peaty or loamy soil, with a slightly acidic ph. It will also accept more sandy soils, but these should be enriched with compost or leaf mould to assist with development. In early spring, a little extra fertilizer can be added around the roots if the soil is not rich in nutrient or very sandy. 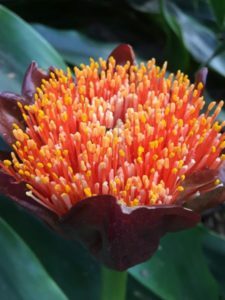 They have moderate water requirements, and if planted in the ground in a warm, moist garden with high summer rainfall, they will not require much additional watering’s. In a container, more water will be required, but care must be taken to not let the soil become waterlogged as they are prone to root rot. 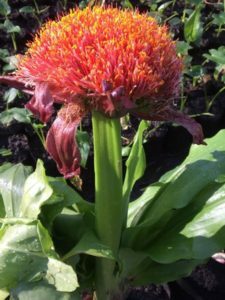 Scadoxus puniceus enters a dormant phase in winter, and will require little to no extra watering then, preferring to be kept dry. They do not like to be disturbed once settled, and if they must be moved, it is preferable to do this in winter to reduce stress. Harvest the ripe, bright red seeds from the old flower remains, then remove the fleshy pulp surrounding them, as this will inhibit germination. Sow the seeds in a well-drained, loose mixture of fine river sand and compost (2:1), and place in a warm, brightly lit area (not direct sunlight). Place the seeds close to the surface of the growing medium, and lightly press them down into the soil. It is not recommended to cover them with a layer of soil. 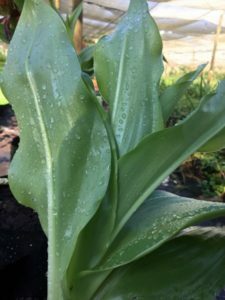 The soil should be misted often, but adequate time should be allowed between watering’s for it to dry out a little, to prevent mildew setting in. Germination typically occur within 2-3 weeks after sowing, but the new plants are very slow growing. 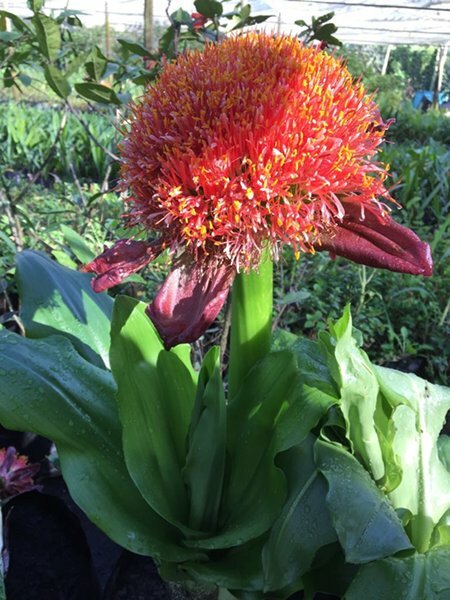 After a few weeks, the bulbs typically send down a small taproot, and should not be disturbed or moved. For the first year or so, very little progress will be seen, and they generally only start producing true leaves after about two years. 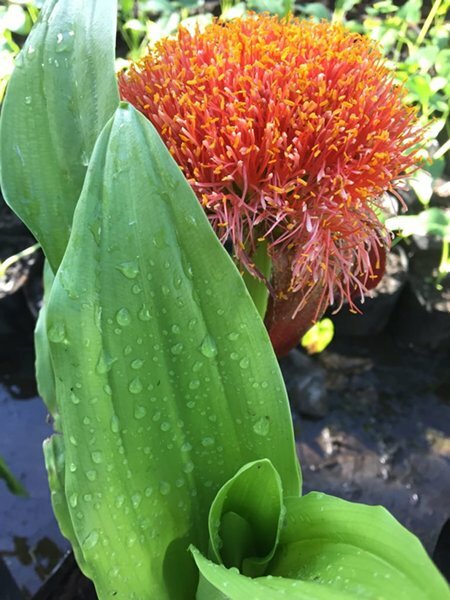 Grown from seed, Scadoxus will start flowering after more or less four to five growing seasons.